Heavy rain accompanied with gale triggered by Phethai cyclone disrupted the railway, flight services and road traffic on Monday, much to the inconvenience of the passengers. In view of the cyclone, many trains and more than half a dozen flights were cancelled. Hundreds of passengers, who reported early at the airport, were stranded. It is learnt that though some flights made attempts to land, but were diverted to other airports early in the day owing to gales. I reached the airport by 6.45 a.m. to catch an IndiGo flight to Bengaluru, scheduled to take off at 7.45 a.m. Even after checking-in, no boarding call was made until 7.15 a.m., Aditya from Visakhapatnam, who was employed in Bengaluru, told The Hindu. On equiry, the airline official told Mr. Aditya that the flight could not land due to strong winds and the serveice was diverted to Hyderabad. They initially said that the flight would come back to Vizag at 9.45 a.m., but later announced that the Vizag - Bengaluru and Vizag - Kolkata flight were cancelled for Monday, he said. A horticulture official V. Anuradha had to return from airport in Hyderabad as the morning flight bound to Vizag was stranded there. She was given the option either to go to Rajahmundry or wait till the evening to board another flight to the Vizag. She chose to go to Rajahmundry as she had to return urgently, said her husband who lives in the city. Most of the flights, scheduled to land and take off from Visakhapatnam Airport, were either cancelled or diverted to other airports on Monday, Airport Director G. Prakash Reddy said. Hundreds of passengers were stranded at the Dwaraka Bus Station (DBS) Complex as around 400 buses bound to Rajahmundry, Kakinada and Vijaywada were cancelled on Monday. The APSRTC, Visakhapatnam region, incurred a loss of about ₹50 lakh. Though we did not cancell the city services, we reduced the frequency as there were not many commuters owing to the inclement weather, Deputy Chief Traffic Manager (urban) Sudhabindhu told The Hindu. The city railway station wore a deserted look on Monday evening as many trains were cancelled. 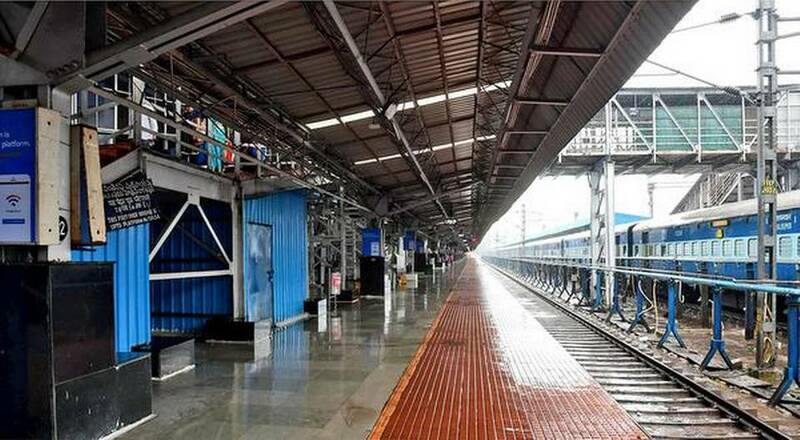 The cancelled services on Monday are: 67295 Rajahmundry-Visakhapatnam MEMU passenger, 67244 Visakhapatnam-Kakinada Port MEMU passenger, 67296 Visakhapatnam-Rajahmundry MEMU passenger, and 67241 Vijayawada-Kakinada Port MEMU passenger .57225 Vijayawada-Visakhapatnam passenger, scheduled to depart Vijayawada; 57226 Visakhapatnam-Vijayawada passenger scheduled to depart Vizag, 17239/40 Simhadri Express; 12717/18 Ratnachal Expressand 12805/06 Janmabhoomi Express have been partially cancelled between Visakhapatnam and Vijayawada on Monday. Several trains are being controlled at different stations. They are 12839/40 Howrah-Chennai Mail, 22642 Shalimar Trivandrum Express,12510 Guwahati-Bangalore Express, 12863/64 Howrah-Yesvantpur Express, 18463/64 Prashanti Express, 17015 Visakha Express and 13352 Alleppy-Dhanbad Bokaro Express . A helpline cell has been set up at Visakhapatnam railway station with the numbers: 83003, 83004, 83005 and 83006. The passengers also can dial on BSNL landlines: 0891-2746619/2746330/2746344. For cellphone users, the helplines are 8106053051 (Airtel) and 8106053052 and 8500041670 and 8500041671 (BSNL).